Born in Cork, William John English VC was educated in and lived in Belfast for many years and served in World War One, World War Two and the Boer Wars. William John English VC is one of the few Irish-born recipients of the Victoria Cross. The Victoria Cross is the highest award for gallantry in the British and Commonwealth forces. English was born on 6th October 1882 in Co. Cork. He was the son of Major William English OBE, a Quartermaster in the Army Service Corps and Marian English of Cork, Ireland. He had two sisters and a younger brother, Henry Cecil. Imperial War Museum Photo: VC 385 (Part of the Imperial War Museum VC and GC Collection). Lieutenant William John English, 2nd Scottish Horse, awarded the Victoria Cross, Vlakfontein, South Africa, 3 July 1901. Copyright Imperial War Museum. Used under Fair Dealing. He attended Harvey Grammar School in Folkestone, Kent from 1894 to 1898. After this, he moved to Belfast, Co. Antrim where he continued his education at Campbell College from September 1898 until July 1899. Soon after leaving school, he took a position in the Merchant Navy. In 1890, he went to South Africa and joined the Scottish Horse that November. The Scottish Horse was a regiment raised in South Africa. At the age of 18, he was commissioned in March 1901. In November 1900, English left the Merchant Navy in South Africa. On 25th November, he joined the Scottish Horse, a regiment primarily of Scots men that was raised in South Africa. He served 112 days in their ranks. On 17th March 1901, he was commissioned as a Lieutenant in the newly formed 2nd Scottish Horse. On 3rd July 1901, as part of no. 3 Mobile Column, English engaged in the pursuit of Boers and their cattle in Vlakfontein, Eastern Transvaal. Commanding Officer Colonel Benson postponed the pursuit until the next day. The column then retired to camp on hearing a large herd of cattle was being moved to Roodekranz. During the action on 4th July 1901, Major Murray and Captain Lindsay of the 2nd Scottish Horse and 25 men from F Squadron became isolated. They came under heavy attack from around 60 Boers for three-quarters of an hour. E Squadron came to the rescue, forcing the Boers withdrawal. 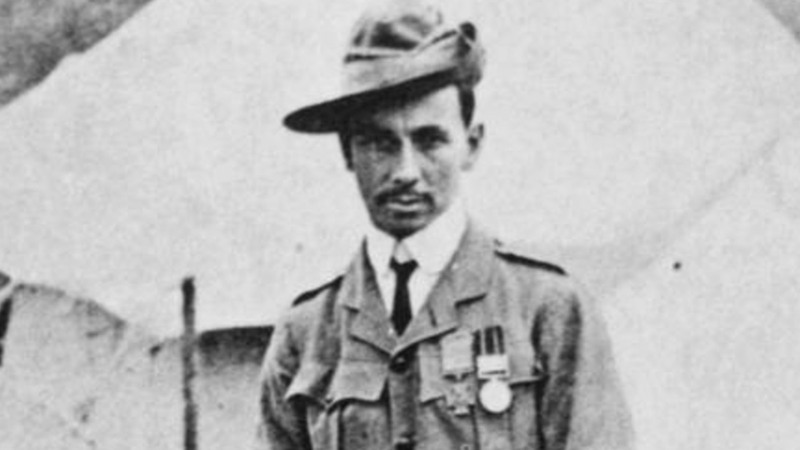 English held the right position at Elandskloof and received the recommendation for the Victoria Cross. Major Murray wrote to Colonel Benson commenting on the young Lieutenant’s “personal pluck”. Colonel Benson, Brigadier General Spens, and Lieutenant General Sir Bindon Blood endorsed the recommendation. It was sent to Commander in Chief Lord Kitchener at Army Headquarters, South Africa. 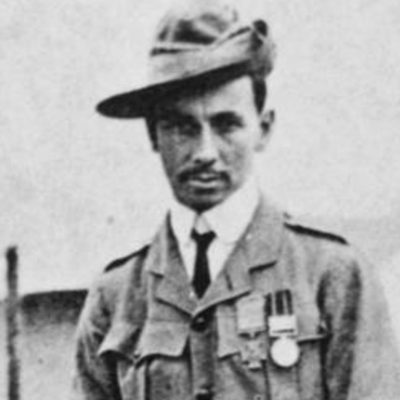 Lieutenant English was the youngest person to receive the Victoria Cross in the South Africa War, aged 19. He was the 503rd person to receive the medal and still one of only thirty under the age of twenty. English was released from military service on 31st May 1902 with the signing of the surrender at Vereeniging. He had spent one year and seventy-six days with the 2nd Scottish Horse. On 1st July 1902, English received his medal from the Prince of Wales at the inspection of the Colonial Contingents at Horse Guards Parade, London. The Prince of Wales in question would go on to become King George V.
Not much is known about William English’s career between 1st June 1902 and 5th April 1905. It was then he enlisted in South Africa as Private 6464 into the Dragoons of the Line, Regular Army. On the same date, he received a posting to 2nd Dragoon Guards (Queen’s Bays). He was promoted to Lance Corporal on 7th October 1905 and after 1 year and 194 days in their ranks was discharged on 16th October 1906. On 17th October 1906, he was commisioned P/13060, a 2nd Lieutenant in the Army Service Corps. In November 1906, he returned to the UK for home leave and training in Woolwich and Aldershot. The Irish man’s first posting was General Duty in Dublin for four months. His next posting was a return to South Africa for almost five years before being posted to Portsmouth before World War One. On 27th October 1907, he was promoted to Substantive Lieutenant. William John English’s first wife was May Dunne. She died in 1918. The couple had two sons. William Frederick Malcolm English was born on 10th July 1908 and died aged 25 on 5th August 1933 in South Africa. Dennis Ormonde English was born on 28th February 1915 and died aged 80 on 5th June 1994. William John English also saw action in World War One with the Royal Army Service Corps. On 5th August 1914, English was made Captain, departed for France and until 6th December 1914, he served there and in Belgium. He then returned to the UK for 13 days leave followed by postings within the country until 30th September 1915. It was then, he returned to France and Belgium where he fought until 11th November 1918. Between 30th November 1914 and 30th September 1920, he served as Temporary Major. On 26th June 1920, King George V hosted an afternoon garden party at Buckingham Palace. All recipients of the Victoria Cross were invited and William John English attended. His Majesty the King was accompanied by the Queen and members of the Royal Family. Recipients of the Victoria Cross gathered at Wellington Barracks and paraded to the palace gardens. Their march behind the band of the Welsh Guards took them along Birdcage Walk, Horse Guards Parade, and The Mall. With the end of World War One, English remained in France and Belgium serving until 30th September 1919. He was then posted to the UK where he remained until leaving for Sierra Leone on 22nd March 1922. In 1922, William John English married Mary Isobel “Molly” Pyper. Molly was the daughter of William Pyper. Pyper was Master of Elocution and English at Belfast’s Campbell College between 1895-1917 when English attended. William and Molly had a son and a daughter. Patrick John English was born on 16th November 1922. He served as a Captain in the Royal Signals, XIV Army in India and Burma and was mentioned in despatches. Patrick died in August 1973. A daughter, Barbara was born in 1926. On 29th April 1923, he arrived back in the UK and was posted to Northern Ireland on 15th October 1923. Since 30th September 1920 he had been a Substantive Captain and was sent to Germany on 23rd December 1924 to serve with the Army of the Rhine. One month earlier he had been made Substantive Major. On ending his time in Germany, he joined the Royal Indian Army Service Corps. Service with the Royal Indian Army Service Corps began on 28th November 1927. After exactly one month, English was posted to No. 12 Motor Transport Company. He served with them in India until retirement in December 1930. Between December 1930 and August 1939, English retired to Northern Ireland and lived at no. 10 (now no. 16) King’s Road, Knock, East Belfast. While there, he was the Northern Irish organiser for the National Association for Employment of Regular Soldiers, Sailors, and Airmen. During this time, he received the King George VI Coronation Medal in 1937. It was awarded to all holders of the Victoria Cross. In August 1939, 200th Territorial Army Association Group received orders from the War Office. They were to raise a group of National Defence Companies in Northern Ireland. Lieutenant Colonel William John English VC (19834), then President of the Old Contemptibles’ Association in Northern Ireland, became its commanding officer. Recruiting of men began on 30th August 1939 and within a month 541 other ranks were on the strength of the group. They took over guard duties of vulnerable points and depots from regular troops. This freed men up for the front lines in Europe. Here again, Lieutenant Colonel English was really wonderful in the way he cheered the men along and struggled with higher authority to be allowed to enlist more old soldiers so as to ease the lot of those already so very short of sleep and rest. He was indefatigable in arranging for all the comfort he could get for his troops, his motto being “The men first, the officers next, and myself last”. On 1st November 1939, this National Defence Corps group became the 6th Battalion (Home Defence) of The Royal Ulster Rifles. This battalion would consist of some 1,059 men by August 1940. With men posted across Europe, the strength fluctuated a lot. By the end of 1940, only 864 men made up the 6th Battalion. On 24th April 1941, English relinquished command of 6th Battalion. The War Office played a part, ordering that the Battalion be commanded by a younger officer. English was offered a role, which he refused to accept. Taking the position would have demanded the retirement of an old friend. Instead, he chose to undertake an unknown appointment in the Middle East and embarked for North Africa by sea. This flew in the face of all medical advice, which stated he should not travel to a hot climate. Those who observed his departure for North Africa noted his light-hearted good humour. This was to be William John English’s final war effort. He died at sea on board a vessel near Egypt on 4th July 1941. His death came only 71 days after finishing with 6th Battalion in Northern Ireland. The given cause of death was a cerebral haemorrhage. Against medical advice he was OC of a troopship taking men to the Middle East. While off the West Coast of Africa the ship was attacked by a dive-bomber and received a certain amount of damage which, among other things, wrecked his cabin and brought on shell-shock. They landed at Durban for a few days and again the doctors urged him to abandon the trip owing to the state of his health. He ignored the advice and died at sea some days later. He was buried at Aden. His grave is in Row I, Grave 21, Maala Military Cemetery, Aden, Yemen and is marked with a Commonwealth War Graves Commission headstone. In total, the Irish man saw action in three major wars; the Second Boer War, World War One, and World War Two. He would reach the highest rank of Lieutenant Colonel. The Queen’s South Africa Medal (1899-1902) and 5 Bars (Cape Colony, Orange Free State, Transvaal, South Africa 1901, South Africa 1902). The 1914 Star with Ribbon Bar (5th August 1914 – 22nd November 1914). The British War Medal (1914 – 1920). The Victory Medal (1914 – 1919). The King Edward VII Coronation Medal (with Military Ribbon) (1902). The King George VI Coronation Medal (1937). Merite Agricole (4th Class) (France). Campbell College, Belfast currently loan the medal group to the Imperial War Museum, London. They will form part of the museum’s Victoria Cross and George Cross Collection until 2020. The Ulster History Circle unveiled a blue plaque to remember William English in 2004. Installed at 1930hrs on Thursday 24th June 2004, it stands at his former home at 16 King’s Road, Belfast, Co. Antrim. His name is also remembered on the First World War plaque and Second World War plaque at Campbell College, Belfast, Co. Antrim and also at Abbeyfield Society’s Bell House, 10 King’s Road, Belfast, Co. Antrtim. If you enjoyed this post on "William John English VC", please share with your friends and followers.